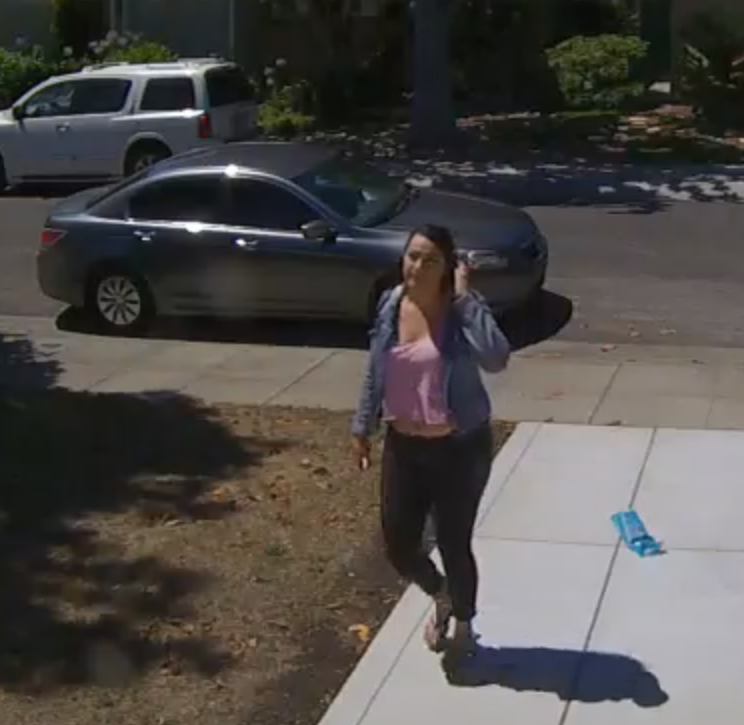 A resident of the Midtown neighborhood of Palo Alto suspects this woman of burglarizing a home on July 20. Surveillance video. The face of a burglar was captured on video after a home surveillance system recorded a brazen theft from a south Palo Alto residence last Friday. The burglary, which took place in Midtown, was just the latest in a string of residential break ins to strike south Palo Alto neighborhoods, according to the Palo Alto Police Department's crime logs. (Click here to see an interactive map of the burglaries). Eight burglaries took place over a five-day period between July 18 and July 22, with about two per day. A ninth burglary occurred on July 14, according to the police logs. Neighborhoods that were hit included St. Claire Gardens, Palo Verde, Fairmeadow, Midtown, Old Palo Alto, Palo Alto Orchards and Greenmeadow. The video from a home surveillance system in one of the Midtown incidents provides an anatomy of a burglary from start to finish and also captured the face of one of the alleged burglars. In the video, a charcoal gray four-door sedan pulled up to the curb and a woman, who appears to be in her 20s and is either white or Hispanic with long, curly brown hair, got out of the front passenger door. She walked up the driveway and glanced up at the camera, raising her left hand to obscure her face. She then disappeared from the camera's view. The video shows her returning to the car after about a minute. The car then made a U-turn and stopped in front of a home across the street and one house down. The woman again exited the car and walked up the driveway, disappearing from view along the front right side of the Eichler home. After about two minutes, she returned to the vehicle for less than a minute and walked back to the house. After 11 minutes, the car backed up a few feet toward the driveway and the woman can be seen walking away from the home, carrying a load. She got in the sedan, and it drove away. The resident said that the thieves took about $7,000 of belongings, including electronic equipment. But the burglary wasn't the first encounter the resident had had with the woman, who had visited her home two weeks prior. "She kept ringing and ringing the bell, and then she said, 'Is so-and-so there?'" the resident said, noting that she recognized the woman and the car when she saw the video. The woman quickly left when the resident answered through the door. The resident looked through a window and saw the dark gray sedan, noting that it had no license plate and appeared to have a dealer's paper plates. The resident said that two of her neighbors also had similar encounters with the burglars, with the woman ringing the doorbell or knocking persistently. Palo Alto police warn residents that in most home burglaries the thieves enter through an unlocked door or window. But the Midtown resident observed that the burglars who targeted her home were bolder. "She breaks down doors," the resident said. The resident has supplied the police department with a copy of the video, but she also wants to set up a Neighborhood Watch program, she said. Anyone with information about these incidents is asked to call the Palo Alto Police Department's 24-hour dispatch center at 650-329-2413. Anonymous tips can be emailed to paloalto@tipnow.org or sent by text message or voice mail to 650-383-8984. Great advertisement for Nest! And scary for those of us who are not home all day. I saw a vehicle fitting this description driven by a woman slowly cruising the Duveneck/St Francis neighborhood last week. She did not stick around after spotting me and my having noticed her slow drive by. For people who don't have time to watch the video, can someone please post a frame capture of the suspect and vehicle? Thank you. It's taken from 59 seconds into the video. Also 3 car burglaries on or around July 11/12 on Cork Oak. if everyone in Palo Alto... shares this photo of woman and car on their social media... Facebook... twitter... instagram... etc etc... at some point, this woman and her car will be identified in the midst of a robbery and caught. Nothing like being caught red handed. On another note.. .our car got stolen in Palo Alto last year. It was found parked on a city street in Redwood city. The Redwood city police didn't go through the thief's belongings in our car (seemed he had camped out) and asked us to take the car and dispose of the thief's belongings as they had no room in their police cruiser. We come home and as we are going through the stuff in the front seat, find the thief had made a temporary credit card out in his name that day. I took a photo of said receipt and name and emailed it to Redwood city police and they came within 20 minutes to pick up the thief's stuff. However, even with evidence in our car the thief left behind, we have yet to hear of an arrest by the Redwood city police. Such is... the law I suppose. The article lists St Claire Gardens as one of the neighborhoods reporting a burglary, but the map does not any address in SCG, or in fact anywhere close. Amygdala is a registered user. This is why I bought security cameras two years ago. So many people had their mail stolen-- even FedEx boxes were stolen off people's porches. Plus, when the USPS or UPS say they delivered something at a certain date and time, but you never received it, you can find out for sure if it was a theft or a delivery person never bothering to make the delivery! Alger Drive is part of St. Claire Gardens, at least according to this Google map. The car is a 2010 Honda Accord LX 4-door Sedan. BP Resident is a registered user. In March 2016, I contacted the PAPD to report a suspicious activity involving a woman, using her 2 dogs as decoy, wandering in my yard and entered my gated sideyard but was told by the officer I spoke to, that because nothing was taken, no crime had been committed. There was another accomplice who took on the street as a look-out and the woman who approached my front door walked away when she saw the camera. I insisted on an incident report, so I could have a case number and submit the surveillance video. The officer reluctantly took the incident report and I submitted the video but I am sure it just got filed into a black hole.